Ubisoft has released a new story trailer of Far Cry 5 that reveals a bit more about the doomsday cult that players will have to take down starting March 27. 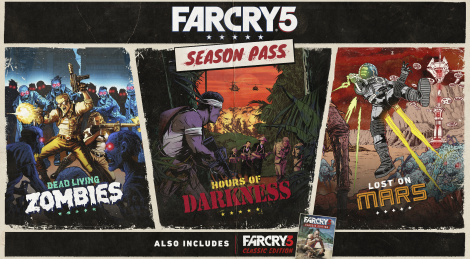 The publisher also revealed Far Cry 3: Classic Edition which is part of the Season Pass and allows console players to re-experience the single-player content while PC owners of the pass will get access to the full game. It will also be available as a standalone purchase in Summer 2018. The post-launch content also includes three new adventures: Hours of Darkness, Dead Living Zombies and Lost on Mars with more details about them soon. SAN FRANCISCO — February 2, 2018 — Today, Ubisoft announced the content of Far Cry® 5 Season Pass, available as part of the Far Cry 5 Gold Edition or as an add-on purchase on PlayStation®4 computer entertainment system, Xbox One and PC. Additionally, all Far Cry 5 Season Pass owners playing on consoles will receive the single-player content from another critically-acclaimed Far Cry series entry with Far Cry® 3 Classic Edition, which will be available to season pass holders four weeks prior to launching as a standalone purchase in summer 2018 on PlayStation 4 and Xbox One. Far Cry 3® Classic Edition will let fans and newcomers to the series revisit Rook Island and encounter one of the franchise’s most notorious villains Vaas, who is brought to life by Michael Mando. As Jason Brody, players must explore the tropical island to find and save his friends, who are being held captive. PC players who purchase the season pass or Far Cry 5 Gold Edition will receive the full version of Far Cry® 3.
is this a ps3 game? farcry 5, i mean. Yeah not PS3, but it's not as impressive as I thought it would be. Something seems off, the hair/fur looks very static and the animations at times seem choppy/dated imo. But will wait until some PC 1440p/4K 60fps gameplay comes out. Lets hope Ubisoft have decent AI in this game and not the spot you from 2 miles away and have 100% accuracy when shooting at you like Wildlands. Is there a Far Cry game with a black antagonist? That's a weird question. Does it matter? No, representation is pointless and all games should be white. lol, personally, I think this whole issue is often misunderstood. In any country, the cinema and other media will represent the culture, religion, and races of those who are in the country. The representation of the media content as a whole is also naturally proportional to the religious-cultural-racial proportions. It is not out of racism, but simply a matter of making content that resonates best with the audience. But in Europe and the Americas (which also happens to be majority white populations), there has unfairly been an overreaction against this natural trend. The stigma tends to come from the history of racism/slavery. Instead of simply correcting the mistake of considering certain races as inherently inferior, there is an overcompensation in denigrating ones own race/culture/religion, while upholding any foreign culture/religion. Also due to some other philosophical/political trends that took place in the past 500 years (Renaissance, Liberalism, Modernism), Whites also tend to be the ones who are most interested in something novel in terms of culture & religion. So all of a sudden, there is a solid market for media content in the European and North American part of the world that is denigrating of the local population, while portraying a rosy view of everyone else. In any other country, such media would fair so poorly that such things would be rarely funded in the first place. Games like this one are simply just appealing to that trend. Of course, while all of this is fine as mere entertainment, the dangerous aspect is that media content tends to slowly change social perception as well. So in the long term, it can have adverse effects on a nation. Americanization will unite us all. That's the Most American thing i've seen today, lol. With false bible nazis and guns everywhere, the depiction is accurate af. Such nonsense out of context DLC's again.. I'm actually glad they did this again because it makes the choice of only buying the "standard" game a lot easier.. I think of recent Ubisoft games I only bought DLC for The Division as that really added to the standard game unlike all these nonsense DLC's about zombies etc..
Come on let the guy be offended! You guys seem more offended by the question, tbh. i keep forgetting this game even exists. feels like it was announced years ago. Yeah pretty much this. It seems like exactly the same game i played 5-6 years ago with not as good setting.